All The Pretty Dresses: Do they have this in black? 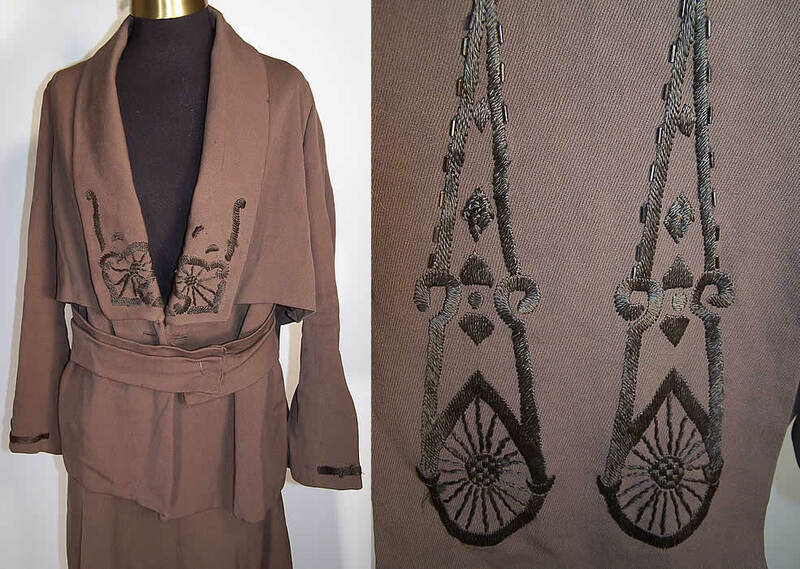 This antique Edwardian era Arts & Crafts embroidered wool walking suit jacket skirt dates from 1915. It is made of taupe dark grayish brown color wool fabric, with raised padded satin stitch embroidery work and beaded accents done in an Arts & Crafts Movement design. This lovely two piece ladies tailored travel walking suit includes a loose fitting mid length boxy style coat jacket, with a layered effect, open front plunging neckline, long lapel collar, long full sleeves, a draping back panel and belted front. 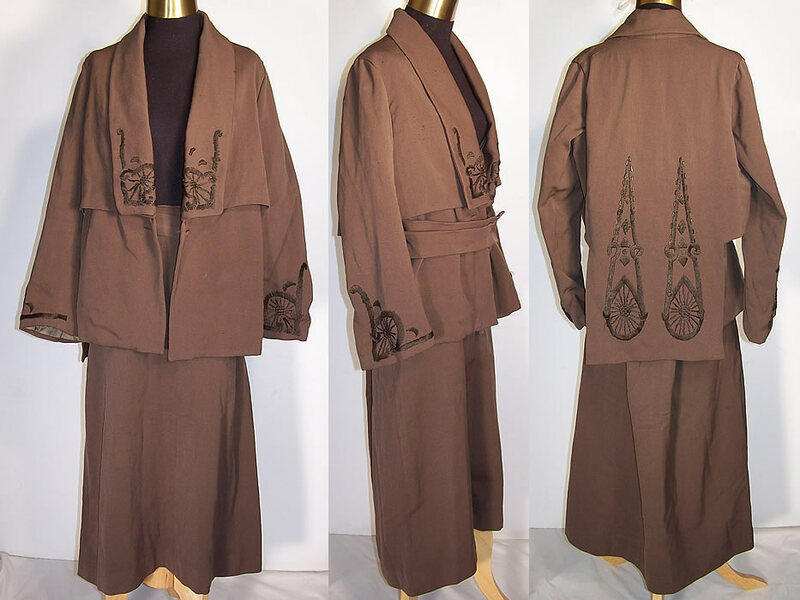 It is fully lined in a brown silk satin fabric. The jacket measures 26 inches long, with 40 inch hips, a 38 inch waist, 38 inch bust, 13 inch back and 22 inch long sleeves. Included is a matching fabric long tea length skirt, with front side slit pockets, an attached belt and hook & eye closures. The skirt measures 35 inches long, with 40 inch hips and a 28 inch waist. This wonderful women's walking suit would have been worn for travel. It is in good wearable condition, with only a few tiny faint stains on the jacket lapel and the belt is missing the front closure. Truly a great wearable Arts & Crafts Movement textile! I want to wear this to work. This would be an awesome suit! Even if it is a bit too big.